FDNY Kicks off Summer Block Parties! Hi Friends! It’s Siren here hoping you are all staying cool this summer! One of the great ways to beat the heat is to go swimming at the pool or beach! Did you know that New York City is surrounded by 520 miles of water? With so many great opportunities to head to the beach, it is important to be #FDNYSmart! Before heading in, read up on these Tips to Staying Water Safe. Make Sure a Lifeguard is Present: It is important to only swim where lifeguards are present, follow directions and don’t go in by yourself! I always bring along my best buddy Hot Dog when heading out for a swim. Learn to Swim: Don’t go into the water if you don’t know how to swim. Remember, it is never too late, or too early to learn that life-saving skill. Never Leave Children Unattended: Even if a lifeguard is present, do not leave children alone. It is important to teach children to stay near their adult. Check for Posted Signs and Flags Before Entering the Water: Make sure to read all posted signs and follow the directions of the lifeguard. If you ever see a red flag posted at the beach, know that it is an area you are not allowed to swim. Watch for Dangerous Waves or Rip Currents: A rip current is a strong and narrow current flowing outward from the beach and can present a danger to swimmers. If you are caught in a rip current, the top rule is to not panic. You should stay calm and swim parallel to the shore. Be Alert of Your Surroundings: Do not head into the water if you are tired or cold. Be sure you are aware of your surroundings. Wear a Life Jacket if Boating: If boating, everyone should wear a life jacket. Never use an air-filled or foam beach toys instead of a life jacket. Don’t take Risks: Only wade in areas where swimming is permitted and be cautious of deep water. When entering the water, walk in, do not jump or dive. Practice Sun Safety: Wear proper amounts of sunscreen when out in the sun. Be sure to stay hydrated, especially on a hot day. Check Water Conditions Before you Go: Check weather and beach conditions before going. You can get this information by clicking here. Remember, most of these water safety tips apply to a swimming pool too. If you are beating the heat by hopping to the pool, check out my Swimming Safety tips here. 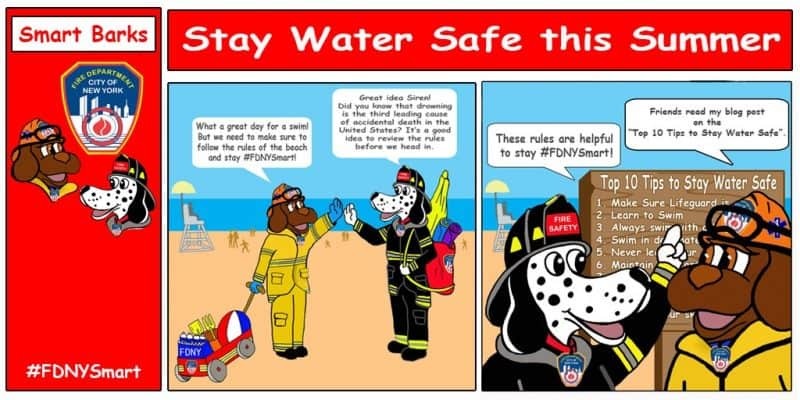 Always be #FDNYSmart when going for a swim at the beach or pool and exercise precaution! For more tips on staying safe, click here. Be sure to follow me on Twitter here.